How to discriminate a simian crease from a Sydney line and a Suwon crease! Re: How to discriminate a simian crease from a Sydney line and a Suwon crease! The Korean report does not mention a need for the II part of II + III to be parallel to Accessory II. I don't see a need to make it a requirement. There is a coming together of 3 major creases on the radial side of the palms. The rising crease II meeting III is not a branch from III. 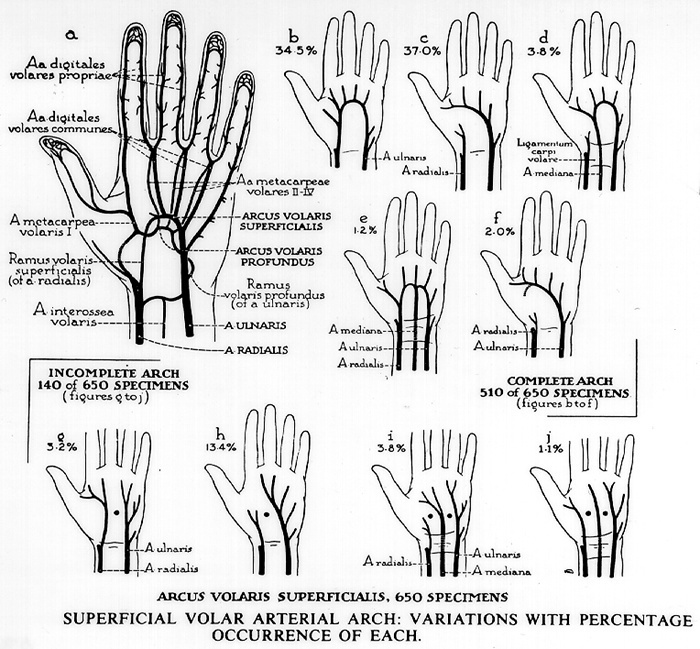 "Lastly, based on variants of I, II, and III, each major palm crease was classified (Fig. 5)." "Accessory variant (C): III is accompanied by accessory palm creases which are parallel and more than half of the III length." Both the requirement concerning the 'parallel' aspect and the 'length' aspect are part of the definition for any acessory palmar crease.... and the researchers have applied these criteria for the heart line, life line AND the head line! Sorry Patti, but this confirms that we can safely EXCLUDE any hand where the line crosses the 'lower' head line... because those hands the line clearly does not follow at least one of the criteria for how an accessory line is defined in the Korean article - specified to the first mentioned aspect: the 'parallel' aspect! The concept of the Accessory creases being parallel, of course makes sense as we have always identified 'sister' or 'duplicated' lines in the same manner. The parallel nature is a reflection of the structure of the palm when flexing. Books on anatomy of the hand point out that the development of the distal transverse crease is associated with the groove outside the volar pads under the middle, ring and little fingers and between the index and middle fingers. This developmental aspect in my view is more important than the need for an accessory proximal transverse crease to be 'perfectly' parallel to the proximal transverse crease, which is not influenced by the volar pads. These developmental facts, I believe, will be the basis for the development of the variants of the Suwon. When we add the concept of 'speed, order and timing' to the inflating and deflating of the volar pads in the palm we can see how the creases can be forced to form in their different locations. The 'freedom' of the proximal transverse crease to form across the shafts of the metacarpals without influence by the volar pads is very interesting. In Kimura's chart with the timing of the appearance of the creases, it shows the proximal transverse crease forms at 13 weeks, about the same time, or after, hand movement begins (which is now known to be at 10 to 12 weeks - and much earlier than the 16 weeks proposed by Kimura's team). I would interpret this as relating to hand movement and flexure influencing the development of the proximal transverse crease. Strong grasping begins after 16 weeks, which is after the head line appears, according to Ashbaugh. These developmental aspects appear to support the Korean's theories on the creases that relate to strong hand grip. The persistence or delays in the inflating and deflating of the volar pads most likely are influential factors in the formation of simian, Sydney and Suwon creases. All that is so interesting. Another developmental feature to consider when thinking about the formation of the proximal transverse crease is the 'superficial arterial palmar arch'. While researching the development of the creases, more than once I found a reference to the superficial arterial palmar arch. Hand surgery texts describe this as being located at or near the location of the proximal transverse crease and in line with an extended thumb. These arteries can form with an ulnar radial connection or less often without. Bundles of nerves run with the arteries. The percentages of the above types of the superficial arterial palmar arch interestingly are very close to these percentages found in the Korean report. Patti, thanks for presenting this interesting picture showing the artery palmar arch systems. ... But after studying the details, I don't think there is any relationship. Patti, please be aware that you are trying to comparing Korean palmar creases (which are known for having a much higher occurence of simian creases) with frequencies of artery systems observed in Westerns subjects. So, the 'parallels' that you observe... are very likely of a 'spurious' nature; and I think it is also hard to imagine any explanation for such a relationship (again, I have the impression that there has never been described any connection between palmar creases and the hand's arthery system). And especially since the simian crease is the most 'unusual' hand line variant... this should have been confirmed somehow in the artery system (though I can not imagine how), but this is not the case at all: because the artery h-variant shows much more similarities with the very common artery c-variant (in the h-variant there is no ulnar branch which reaches out to the thumb, but this is also true for the artery g, i and j variants). I think a relationship could relate to the nerves that move along with the arteries sending signals relating to hand movement. I also think the early folding of the hand would be influenced by what it is folding around. It would likely fold just above the developing bundle of nerves and the superficial arterial arch. Also important is the reference for surgeons to relate the proximal transverse crease to this artery. Patti wrote: ... Also important is the reference for surgeons to relate the proximal transverse crease to this artery. Because I think that reference probably only works just as 'a point of reference' for where the arterial arch is typically found - but that does not implicate that there is any link between the variations in the shape of the proximal transverse crease and the variations in the shape of the artery system. So regarding your point regarding the statistics, I think that reference has no value at all. Sorry, but I can not confirm your observation. Actually, there have been studies related to the location of the creases and the superficial arterial palmar arch. A biometric study on the relationships between the deep palmar arch and the superficial palmar arch, the distal wrist and palmar creases. 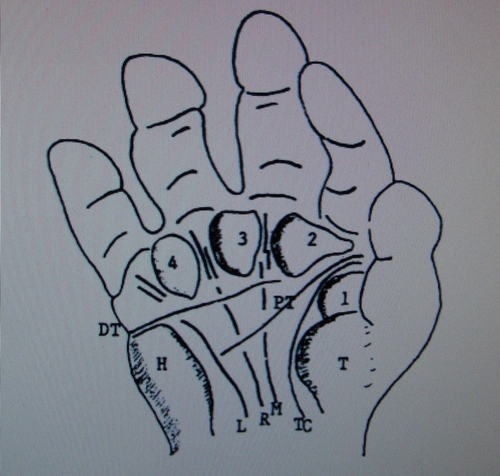 The topographical localisation of the palmar arches is important in hand surgery. The aim of this study was to contribute with biometric data on their positions and to correlate this with the size od the palm. We studied 60 hands of 30 adult fixed cadavers, of Brazilian origin, from both sexes and between the ages of 21 and 70 years. The arteries of 54 hands were injected with latex Neoprene. Before dissection the distance between distal wrist crease (DWC) and the proximal palmar digital crease of the middle finger (PDMC) was measured. Also, we recorded the distance between the DWC and the proximal and distal palmar creases (PPC, DPC). After dissecting the superficial palmar region, the distance between the superficial palmar arch (SPA) and the DWC was recorder. We then dissected the deep palmar arch (DPA). The average distance between the DPA and DWC was always measured in the midline of the palm. The average distance DWC-DPA was 33.7 +/- 2.6 mm in the female and 36 +/- 4.0 mm in the male. The difference was statistically significant. The average distance between DPA and the PPC was 24.2 +/- 3.0 mm in the female and 27.1 +/- 4.1 mm in the male; this difference was significant. In 83% of cases the DPA was proximal to the SPA and in 14.9% was distal to it. The linear regression test for the relation between DWC-PDMC and DWC-DPA was significant in the male and this fact allowed us to obtain the linear equation to predict the distance DWC-DPA. Other parameters were also considered. The results may be useful as a reference to radiologists as well as to surgeons. "The position of the superficial palmar arch was 2.7 cm distal to the hook of the hamate or at a line bisecting three-fourths of the distance from the distal flexor wrist crease to the proximal palmar crease. The relationship of the superficial palmar arch to topographical landmarks was more consistent than it was when the standard reference of Kaplan's cardinal line was used." "We recommend the use of topographical landmarks and other anatomic considerations during endoscopic carpal tunnel release." Patti, I don't see how those studies are relevant regarding your observation - because both studies did not focuss on variations in the shape of the artery, nor did the studies consider variations in the creases. Only some distances were measured in the central axis of the palm, and those appear to be quite stable - for example: the difference reported for the males and females is a direct result of the difference in hand size! Apparently from what I can tell, research has mainly been done on cadavers. It also seems very little research has been done to compare deep hand structures to surface features. Most likely no one has taken a good look at the inner hand structures of those with simian or Sydney creases. However, the studies that have been done show a relationship exists between the superficial arterial arch and topographical features. It seems logical to me that if we're applying behavioral characteristics to a feature in the hand, such as the simian, that the nervous and cardiovascular systems would be involved. Oh yes, sure Patti: I understand why you call it 'logical'... and I agree that it would have been logical if we had found evidence which points into that direction. But the materials that you've presented so far, including the statistics that you mentioned, do not present any evidence which could explain some of the variation in the creases. So I think we drifted away from the topic in this discussion: how to recognize the differences between various 'transversal crease' types. My posts in this thread the past couple of days illustrate the variable nature of the location of the proximal transverse crease and the underlying structures. The distal transverse and the thenar longitudinal creases are heavily influenced in their locations by the volar pads that are present at the time of their development. The PTC forms during and after hand movement begins and near to or after the deflating of the volar pads. Its territory is mostly free of restrictions across the shafts of the metacarpals. The accessory creases, according to Ashbaugh, form after the major creases or after 14 weeks. In the case of the Suwon, I would interpret Ashbaugh's 'accessory' to be the radial crease rising to meet the DTC. The extra crease, the Suwon, brings together three major creases relating to strong hand grip. A gripping posture likely shapes the Suwon. A double PTC would be expected to be parallel to each other and run horizontally across the palm. The Suwon is a crease that reaches up to the DTC on the radial side of the palm. This indicates that the Suwon crease (or the II part of II+III) is moving in a direction not common for a PTC. The Accessory PTC can be located anywhere a typical PTC is normally found, which is not necessarily parallel to a rising crease. I think I have supported my argument that the II part of II + III does not need to be parallel to Accessory II. Other than your interpretation of one line of the Korean's report, which is a generalization and not specific to the PTC, can you support your statement that these must be parallel? Patti wrote: ... Other than your interpretation of one line of the Korean's report, which is a generalization and not specific to the PTC, can you support your statement that these must be parallel? Patti, your request suggests that I have made a hypothetical observation regarding the importance of the word 'parallel' in the definition of the Suwon crease (figure 5)... but my observation is literally written in the article (see the lines that I already pointed out earlier). So, all I did was taking the details presented in the article litterally. Therefore I don't see any substantiated need to request more support for my observation... again, unless you are able to proof yourself that those details should not be taken as literally as I have pointed out!! PS. I think your focuss was so far not to proof that those details should better not be taken literally. Instead - from my point of view - you have only created speculative arguments with unrelated materials... and these require far too much phantasy for me to be accepted as solid arguments. I think your quote for the accessory creases to be parallel and at least more than half the length is a requirement of the normal main creases when there is a 'sister' line. In Table 4 there is a category for the accessory creases for II. These Accessory II's are most likely not Suwon related (see female category). They would follow the rules for Accessory creases and are most likely double head lines. The Korean's report that the Suwon's Accessory II is associated with I. "Second, Sydney creases are more frequent than Suwon creases because Sydney creases have accessory III, which is not close to any major palm creases, while Suwon creases have accessory II, which is close to I." "Based on the relationships between I and II, palm creases were classified into closed, open and meeting creases. Based on the relationship between II and III, palm creases were classified into normal, simian, Sydney, and Suwon creases. Lastly, based on variants of I, II, and III, each major palm crease was classified." Suwon is based on the relationship of II and III while its accessory II has a relationship with I and can be 'closed, open or meeting'. Patti wrote: I think your quote for the accessory creases to be parallel and at least more than half the length is a requirement of the normal main creases when there is a 'sister' line. The 'order' that the researchers describe in your quotes, shows that the Suwon creases were already classified BEFORE the classification of the 'variants' for I, II and III...!!! This explains that in table 4 all 'accessory creases' for the head line should not be associated with the hands where a Suwon crease is observed - which is confirmed by the statistics in table 2 and 4. And this choice perfectly makes sense (from my point of view), because it would not make sense to qualify head lines as 'accessory' when they actually fuse with the heart line. Afterall, the Suwon crease was presented as an independent category... and therefore it makes sense that those hands are not included in the summary of the variants of the creases that do not make a fusion/connection with the other lines. However, because of the vocabulary used in how the Suwon crease is defined, regarding the word 'accessory' there can be no doubt about that the researchers have used for the II part of the Suwon crease exactly the same criteria as for all other 'accessory' lines (the aspects: 'parallel' + 'length'). But in those hands those lines were counted as a 'Suwon crease' and not as a 'accessory' variant. PS. The same is true for the Sydney line variants which are created by the presence of an extra crease starting from the ulnar side of the hand (Sydney 2, 3 and 4) - also confirmed by the statistics in table 2 and 4. An additional reason that I don't think the Korean's infer that Accessory II of the Suwon needs to be parallel to II is because technically there is no II. There is a "II + III". In the Sydney we have the same situation there is no III. In many cases you cannot tell where II actually ends and III begins. They are II + III. II + III is considered a single crease made by the merging of II and III. Nowhere does it say Accessory II of the Suwon needs to be parallel or half of "II + III". Fig. 7 illustrates the locations of II + III in the Sydney crease and the locations of Accessory III. The two most common locations of Accessory III are not parallel to the most common locations of II + III. Definitions are usually not spelled out by detail in just one sentence. Where they introduced the Suwon crease they only mention the formula (II+III plus accessory II), and regarding the elements that are included in the formula: those details are spelled out elsewhere in the article! But I think there can be no doubt about that the article does explicitely describe the requirements for the Suwon crease... via the definitions of the elements in the formula. Therefore I can only advice you not to ignore any detail in the definition of the 'accessory crease'. Sorry, I don't understand why you are trying to argue that the requirements for an 'accessory crease' (as described in figure 5) are not applicable to the 'accessory II' in the Suwon crease definition. Because now it looks like that your only argument appears to be: that the researchers have not described all details in just one sentence. Actually, I think this can never ever - in any context - be used as a valid argument... okay, unless the authors had promissed you to present a definition with just one sentence. Yes, we can debate about the quality of the format how the guidelines are presented, but it is quite irrelevant where exactly those guidelines are presented in the article. Patti wrote: Fig. 7 illustrates the locations of II + III in the Sydney crease and the locations of Accessory III. The two most common locations of Accessory III are not parallel to the most common locations of II + III. Patti, ... all I can say is that figure 7 only presents the most common starting and terminating points, and the connecting lines only are only 'imaginary' lines which connect the related points. And please notice that the dots are always positioned in the center of the little squares, so they represent any point in the square. Now, all I can see is that IF those points were connected with straight lines ... that would always result in parallel lines. But I think you are comparing again apples with pears, because we can not be sure that that the most common points for II+III are related to the most common points for accessory III. Sorry, regarding your red words... I can so far only conclude that you probably misunderstood the purpose of the connecting lines that are displayed in figure 7...??? Fig. 7 - Incidences of the starting and termination points of the radial longi-tudinal crease (I), proximal transverse crease (II), and distal transverse crease (III) of normal, simian, Sydney creases in Koreans. Numbers 1, 2, 3, 4, 5 in illustration mean frequent cases of the individual palm creases. I don't think I have misunderstood or misread the report. We simply disagree.